Some of the stories of the great Mississippi River Flood of 2011 being presented to me are complex and multi-layered and involve sorting through decisions which were made that benefited some and seriously hurt others. Such a story will be coming soon when I share the plight of the farmers of Mississippi County, Missouri. Other stories are simple and luminous – they just shine up out of the mud and mess and can be shared with you just as they appeared to me. Such is the story of Etta and Joe Hughes of Morehouse, Missouri. No one ever dreamed Morehouse would flood. It’s not in the floodplain and nearly 30 miles from the Mississippi River, but these are extraordinary times. The Mississippi was so gorged with water, its tributaries and drainage systems so backed up that one more torrential rain was too much. Water rose quickly into many of the town’s nearly 500 homes, and there was very little time to salvage belongings. For 55 years, the small frame house has been home. Countless hours have been spent on the front screened porch with each other, their three children and grandchildren. 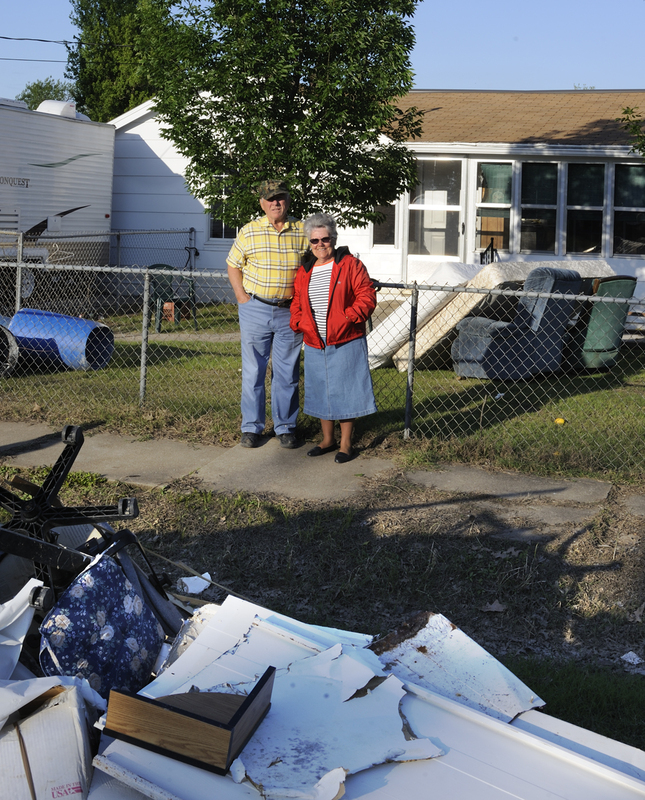 When the water receded, it was clear that virtually none of their accumulated belongings could be salvaged. “Except my stainless steel pots,” Etta says defiantly, pointing to a pile in the front yard. “I’m gonna scrub and scrub and then bleach the fire out of ‘em!” She needs them, she tells me, because every Saturday night their three kids and all the grandkids, “even the teenagers”come for dinner, to play cards or games, visit and catch up. Joe nods, smiles and gives her a squeeze. 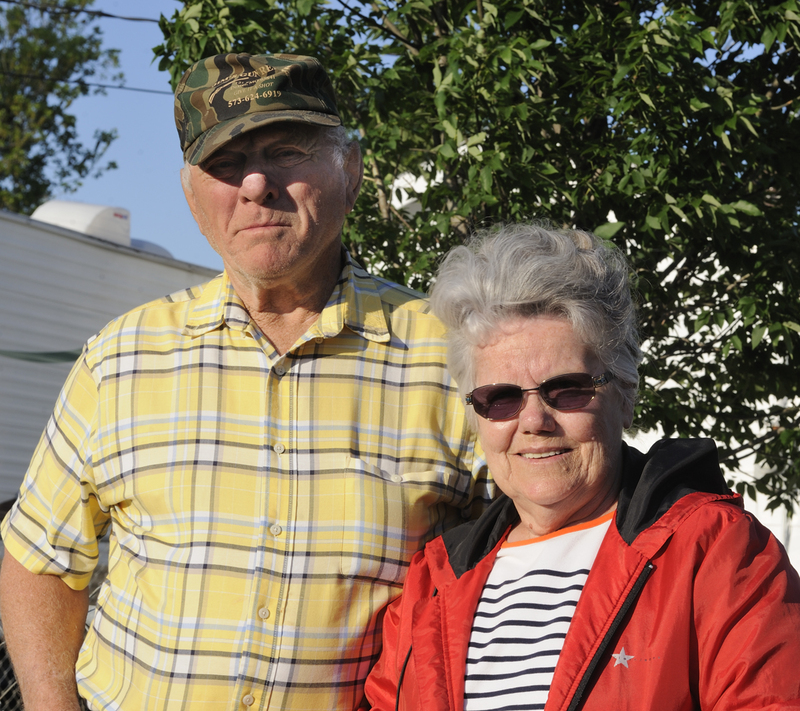 The floodwater took a lot from the Hughes family, but not what really matters. Shine on, Etta and Joe! This entry was posted in 2011 Mississippi River Flooding, MO - Morehouse and tagged Mississippi River Flooding 2011, Morehouse Missouri. Bookmark the permalink. I absolutely love this story. When we are stripped to the core, those who possess wisdom see the core and embrace it. Those whose vision is blurred do not see the core and only see what has been stripped away. We do have the opportunity to choose what will be our focus and that which is extraneous. Thanks for helping us to choose wisely. This is a real story of True Grit. It’s unfortunate that events like this have to take place to make us all realize it isn’t “stuff” that makes us happy. It’s the “stuff” that we, our family and our friends are made of that are the most important. God bless Joe & Etta. My thoughts and prayers go out to them and their community. I always knew these two as Sis. Lou and Bro. Joe. They are some of the best people I have ever known. I have seen them go through so much and they never let anything get them down. I am so happy to see this story about their love and commitment to each other and see how gracefully they are taking their loss. They are a truly blessed couple. Thank you Gayle for letting everyone else know. Great story!